Make “Homemade Bread” without all the work. 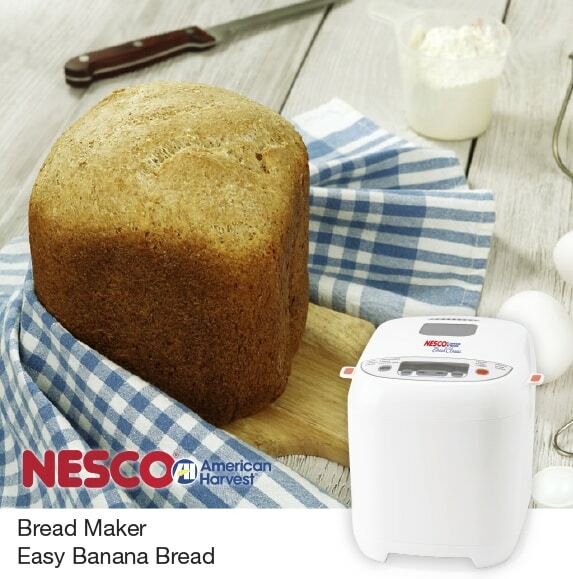 Just add the ingredients and let your NESCO/American Harvest Bread Maker do all the work. This recipe for Banana Bread is so simple and tasty you’ll want to make it over and over again. Put the wet ingredients in the bread pan. In a mixing bowl, mix the dry ingredients and then add to the bread pan. Press Crust Color button to the desired crust color. Press the Start- Stop button or select the delayed start button. Note: Use a spatula to scrape sides of the pan after mixing five min. to remove flour pockets.